Best Patio Furniture Brands for Your Back Yard! Shopping for new patio furniture is exciting, especially given the huge amount of recent innovation in materials in the outdoor furniture market. No longer do buyers need to stick to the old metal table with tempered glass top and a patio umbrella through the center design. Now the open sky is the limit! But which are the best patio furniture brands? We have put together this article to examine several of the top outdoor furniture manufacturers and suppliers around, and to look at a few of their collections. With a wide variety of price points, designs, and styles, and material choices, there is certain to be something for everyone here! After we look at several different outdoor furniture brands, we’ll go through our picks for best outdoor furniture, as well. There are many high-quality outdoor furniture brands, but it’s easy to pick up the wrong set and be stuck with an inferior brand, line, or design. Especially when shopping on the internet, where it’s hard to get a sense for furniture without actually sitting in it! For this reason, we have put together this list of several of our favorite outdoor furniture manufacturers and designers. Going back several years, manufacturers were challenged to find outdoor furniture that could really withstand the challenges of being left outside, and gradually more and more have embraced new materials, designs, and concepts, resulting in some great furniture collections. There’s lots of great stuff here, and we hope you find the perfect collection for your patio space! Modway is a large modern furniture company that doesn’t just focus on outdoor furniture, but they have several outstanding outdoor furniture options, such as outdoor daybeds, swing chairs, bar stools, and the like. Of particular interest to us is their Marina teak outdoor living collection, which is just beautiful, and is quite well made. It has stylish modern lines, a ton of configuration opens, and is made of high-quality Indonesian teak! The Marina collection is extremely configurable, so you can get exactly the pieces you want, and the overall quality and aesthetic of the collection is delightful. Harmonia Living is an outstanding (mostly) high-end furniture brand that supplies both indoor and outdoor furniture. They are San Diego based, and have been around since 2007, making some very cool furniture designs and rapidly expanding their offerings. Harmonia makes a wide range of patio products, from Acapulco Chairs to patio sectional sets to outdoor living room sets. They also have several different lines of furniture with different styles and material choices, with some modern, some traditional, and some transitional designs. Typically they like to work with steel, HDPE Wicker, and Sunbrella fabrics. All great choices! Trex is a huge company, likely best known for their composite decking. Composite wood, also known as polywood or poly resin, is a material made of recycled plastic and (typically) wood pulp, which is blended and colored throughout. CPVC has a look and feel that is extremely similar to wood, but is as durable as it gets! Unlike wood, the color is blended throughout the material, and even if it gets scratched, the color remains. It can handle virtually any reasonable temperature and weather condition. Trex is primarily a bulk composite decking supplier, however, they have an outdoor furniture collection that is surprisingly nice! 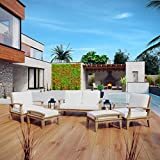 Trex Outdoor Furniture has several different lines available, with the Surf City line [Amazon Link] [Wayfair Link] being the most compelling, with the most interesting modern designs. Trex also has some great all-weather Adirondack chairs, so be sure to check those out if you’re looking for some classic outdoor chairs. “Ohana” is the Hawaiian word for “family”, and when you are relaxing with your loved ones on an Ohana Furniture set, you’ll be happy you chose the Ohana brand! An Ohana PE Wicker Furniture Set was our top choice among luxury conversation sets. Most of their listings are for patio living and dining sets made of PE Resin Wicker, wrapped around a powder-coated steel frame. Their patio sets vary markedly in price, depending on if Sunbrella fabric is used or not. Ohana furniture arrives pre-assembled, which is definitely a nice feature, so you can put away the power drill and Allen wrenches! They also have a lovely Teak outdoor furniture collection that is absolutely worth checking out! Bayview Patio makes a range of outdoor furniture pieces, such as benches and stools, primarily working in teak, one of our favorite outdoor furniture materials. We are smitten with Bayview’s Teak Dining Sets in particular, as they are outstanding. Bayview won our top choice among Teak patio dining sets with its lovely 9 piece Teak dining set. Be sure to seal your teak patio furniture once you’ve got it set up! Modenzi is a relative newcomer to the patio furniture scene, with low prices and high quality offerings. Their selection is pretty basic, with heavily modern design, simple lines, and fun colors. These sets are made in China, and are flat packed — you’ll have to assemble them yourself. Modenzi was our top pick among patio sets under $1000. Most Modenzi furniture is made of PE Resin Wicker, with lightweight and easily-configurable aluminum frames. Modenzi has a pretty wide selection of sectional sofa sets, ottomans, chaise lounges, available in various wicker colors and fabric options. You can see our full review of Modenzi’s furniture here. Laurel Foundry has several lines of indoor and outdoor furniture, though we are primarily interested in their Modern Farmhouse collection, which is swoon-worthy. The Modern Farmhouse collection has a wide variety of outdoor pieces such as benches and tables, patio sectional sets, poly-wood swings, and more! With simple, clean styling and top notch materials, the Modern Farmhouse collection has a super current design, comfortable yet classic aesthetics, outstanding materials, and great pricing. Get a taste of Paris with Fermob’s Luxembourg collection, found at the stunning Jardin du Luxembourg. These pieces are classics, and were designed in 1923 in Paris and still in production in the Paris Parks Department. Fermob refreshed these designs in 2008, and they are also for sale to consumers. With an exuberant joie de vivre, the Luxemborg collection and the Bistro collection are both great choices for those who want simple, classic, super fun outdoor furniture with an outstanding history and timeless appeal. Tropitone is one of the classic outdoor furniture brands, and have been around since 1954. They are now a sub-collection of Brown Jordan furniture. Originally focused around resort furniture, Tropitone expanded its offerings into residential furniture over the years. Tropitone focuses on high end chaise lounges, patio living sets, and conversation sets. Some of their designs are quite modern, like the Mobilis set above, but many are transitional or traditional in design, and Tropitone has much to offer anyone looking for luxury outdoor furniture! If you don’t want to spend much on your outdoor furniture, U-Max is a great choice! The U-Max outdoor sets are PE-wicker sectional sets that are highly configurable. Like the Modenzi furniture mentioned above, these patio furniture sets require assembly, so be prepared. Fortunately, they do arrive in multiple boxes. The cushions on these sets are not of the highest quality, and will likely fade and wear over time. Store them in a deck box or other shelter as much as possible when not in use, and plan on replacing the cushions in a few years. However, the bottom line on these sets is that they are quite inexpensive, and once assembled, are great pieces. La Fete Design has a rather unique collection of outdoor furniture options, and produce stylish, modern outdoor furniture sets that are robust, easy to clean, and incredibly elegant. These modular sectional sets are minimal and feature classic, simple forms. La Fete Design’s format consists of a waterproof, weatherproof marine grade vinyl cover over each furniture piece. They are durable, lightweight, and made of recycled materials. Ideal for resorts and high-end environments, these sets are cool, simple, easily configurable, and striking! There are a wide variety of brands that make outstanding outdoor furniture, and we hope our list has provided some insight as to which brands produce furniture that will stand the test of time, both stylistically and in terms of durability. In the next section, we’ll look at our picks for the Best Patio Furniture, in various styles and configurations. In this section, we’ll look at our picks for the best patio furniture around. We’ll do a high end and low-end pick for each category. Hopefully, these selections will give you some ideas to outfit your patio or deck area! 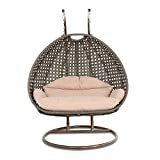 Harmonia Living makes absolutely stunning wicker outdoor furniture. These sets feature all the bells and whistles, including HDPE Resin Wicker Construction and Sunbrella Fabrics. The Urbana set is available in several different configurations, and you can also purchase pieces individually. U-Max is one of our favorite outdoor furniture companies because their furniture is very high quality, relative to the price they’re asking. With several different quantity configurations available, the U-Max set is perfect for those on a budget who want a PE-Wicker Outdoor Set. Unfortunately, the chair covers are only available in the off-white shown. Ship from US in 4 BOXES(9 pieces).Assembly required, Have fun with it! As mentioned above, Modway is a manufacturer of beautiful outdoor teak furniture. The Marina line of outdoor teak patio sets have a ton of configuration options and are built with Grade-A Indonesian Teak. The design of the Marina set is modern, but not severely so, with graceful curves and simple white cushions. The Modway Marina was our top choice among Teak Patio Sofa Sets. Giantex has hit the budget end of the patio seating market perfectly with their 4 Piece Conversation Set. With seating for four people and a clever resin-wicker frame, this set is a great choice in terms of style and functionality. It’s hard to beat the price these are positioned at, especially given the fairly modern build-out of this set! It is our favorite patio set under $300. Bayview Patio has done a great job with their 9-piece Teak Dining Set. With a beautiful Grade-A Indonesian Teak dining table (featuring two optional leaf inserts for flexibility in sizing) and mortise and tenon joinery, the table will be the centerpiece of your outdoor dining setup. The set also includes eight stacking teak dining chairs, all of which have arm rests. 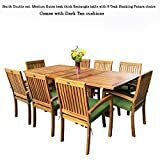 The Bayview Patio Teak set is beautiful and quite practical for those who want seating for several people, and was our top choice among Teak Dining Sets. 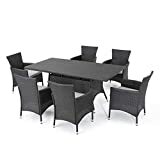 For those who want a robust outdoor dining set with seating for 6, and a great price point, the GDF Studio Macalla PE-Wicker dining set is a great option. The assembly is a bit of a bear, but once you’ve got it all together, this set is attractive and robust. The Macala Furniture Set includes six PE-wicker chairs and a PE-wicker dining table. Glasses and plates sit flat on the table, and no additional glass top is needed. One downside here is that there’s no hole for a patio umbrella, so if you want shade, you’ll need a cantilever umbrella, or perhaps a soft top gazebo. 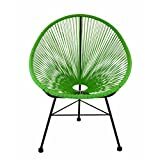 As mentioned above, Fermob has an absolutely stellar pedigree among outdoor furniture manufacturers, and are famous all over the world for their colorful, cheerful patio furniture. But those prices! Ouch. Still, the Luxembourg line of patio furniture is outstanding quality and has many different color and shape configurations, so you can pick just the right set for your needs. 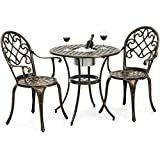 The BestChoice Products Cast Aluminum Bistro Set is hardly modern, but it is a very nice Bistro Set at a fantastic price point. As they are made with Cast Aluminum construction, these pieces are lightweight and rust-resistant. The design of this table features a hidden ice bucket, which is a great little extra. This set was our budget pick among the best Bistro sets. Polywood makes some fantastic pieces of outdoor furniture, but our favorite object they manufacture is their classic Folding Adirondack Chair line. These chairs come in a ton of super fun color options, and in our eyes, the bright and colorful Adirondack chairs always look the best. The Polywood Adirondack chairs feature a high quality build out with CPVC construction, joined by marine-grade stainless steel hardware. The warranty is great, and the fact that these fold up is a big plus in our eyes. These are our favorite Poly Resin Adirondack Chairs. Easy to store. Folds FLAT for easy transportation and storage. 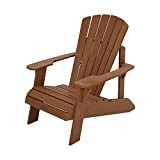 Lifetime’s Adirondack Chair line is a perfectly sserviceableCPVC Adirondack chair option at a great price point. There are only a couple of color options, and they don’t fold. They only have a two-year warranty and are as basic as a CPVC Adirondack chair gets. However, they are priced very close to standard wooden Adirondack chairs and are much higher quality. For this reason, we’ve chosen them as our budget pick. Tropitone’s South Beach line of lounge chairs are stunning but very pricey! 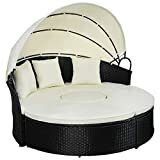 We love the look at the wide variety of color options, but in this category, it’s pretty clear that the Keter Pacific chaise lounge chairs discussed below are a much better choice for all but the most wealthy, style-conscious buyers. Keter really knocked this one out of the park! 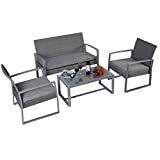 The Keter Pacific outdoor chaise lounge (set of 2) is a fantastic option for an all-weather outdoor chaise lounge at a great price. These chairs are quite comfortable, are made entirely of resin wicker (even the bolts are resin) and are completely waterproof and fully capable of surviving outdoors. They’re also surprisingly inexpensive. They won our top pick among Outdoor Chaise Lounge Chairs. This chair is stunning! The Island Gale two person hanging egg chair can function as a two-person loveseat, or as an (admittedly small) outdoor daybed. The construction of this chair is fantastic, and the hanging, rocking features of the Island Gale make it a super compelling offering. When the cold weather comes on, you’ll want to bring this chair inside and use it by the fireplace! This chair is the best hanging egg chair around. Tangkula’s daybed is much more traditional than Island Gale’s, as outdoor daybeds go. The price point this furniture set hits is fantastic, given its multi-function design. 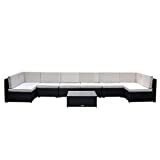 This set can separate, Voltron-like, into four different pieces, and can be used as a sectional conversation set, or can be attached together as a super comfortable outdoor daybed. It also features a half-canopy which is great for those super sunny days! Tangkula sells a couple of different configurations of this daybed, but the four-piece sectional is the best, in our eyes. The Tangkula was our budget choice among Outdoor Daybeds. A staple in design magazines and modern living websites, the Acapulco chair is one of our favorite chairs for both indoor and outdoor use. Invented in the 50s in Acapulco, this chair is quite comfortable and capable of handling both outdoor and indoor environments. While there are several high-quality replicas being made, Design Tree Home does a particularly nice job with their Acapulco chairs, and are our top choice in the category. We thought we’d throw out a twist for our budget choice in this category, and go with a bean bag chair. Bean bags have become more and more popular as comfortable, flexible indoor seating over the last several years. Now, by combining water-resistant outdoor fabrics with waterproof liners, the bean bag chair has gone outside! 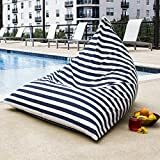 The Jaxx Twist line of bean bag lounge chairs are really fun indoor/outdoor chairs, and is our top choice among outdoor bean bag chairs!